What Are the IRS Rules Surrounding Contractual Employment? An independent contractor is a person or a business that performs services, produces outcomes, or produces products for a business under a written or implied agreement or contract. The independent contractor is not subject to the client's control or direction, except as stated in a contract. The independent contractor decides how to provide the contracted services and negotiates deadlines and deliverables. The expected outcome of the contract may be as specific as two 250 page books or as loose as general assistance and training help to convert the organization to a team-based workplace. While the company contracting for his or her services can set the outcomes and the final products, they cannot tell the contractor how, when, or where to do the work. The independent contractor determines his hours of work, work site, and equipment. The independent contractor provides the contracted services independently, not as an employee. 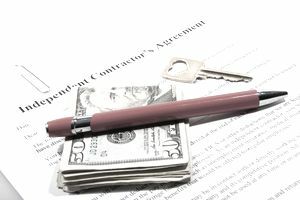 The contracting agency does not control whether the contractor subcontracts a portion or all of the work to subcontractors. The independent contractor pays his or her own taxes and Social Security. Contractors handle their own relationship with the Internal Revenue Service (IRS) by using the appropriate forms and procedures. Who Is Working in This Growing Gig Economy? Another term that is used to describe the legions of short term, temporary, independent contractors is gig worker. Another is freelancer. These workers increasingly participate in what has become known as the gig economy. "Approximately 150 million workers in North America and Western Europe have left the relatively stable confines of organizational life—sometimes by choice, sometimes not—to work as independent contractors," according to the "Harvard Business Review." "According to "Intuit," the percentage of Americans in the gig economy was 34% in 2016 and is expected to grow to 43% by 2020. Consulting firm McKinsey says that there are currently around 68 million freelancers or self-employed in the US, with around 4 million Americans providing work through gig marketplaces like Lyft or Airbnb." Most contracts specify that the contractor is not an employee and, as such, is not eligible for any benefits, perks, or privileges that the employer might provide for employees including health insurance, 401(k) deposits, company events, or pet insurance. Employers rarely offer office space to independent contractors; usually, they set aside a conference room for training, consultations, and meetings. They may offer a company email address to facilitate communication between their employees and the contractor. The business that engages an independent contractor is not liable for the acts or omissions of the independent contractor. Another test of the status of an independent contractor is whether they perform work for more than one business; the independent contractor should. According to the Internal Revenue Service (IRS): "The general rule is that an individual is an independent contractor if the payer has the right to control or direct only the result of the work and not what will be done and how it will be done." Factors that provide evidence of the degree of control and independence of the contractor fall into three categories. "Behavioral: Does the company control or have the right to control what the worker does and how the worker does his or her job? "Type of Relationship: Are there written contracts or employee-type benefits (for example, pension plan, health insurance, vacation days pay, and so forth)? Will the relationship continue and is the work performed a key aspect of the business?" If an employer can answer these questions appropriately, the relationship with the independent contractor is not an employment relationship. Rather a contractual arrangement exists. Employers must weigh all of these factors when deciding whether a contractor is an employee or an independent contractor. There may be elements of each in the work the contractor is performing. Hard and fast rules don't exist for when an individual is deemed a contractor. No one factor stands alone in making this determination. Also, factors that are relevant in one situation may not be relevant in another. If the employer concludes that he is unable to decide upon the appropriate classification, consult the IRS for a determination. The keys are to look at the entire relationship and consider the degree or extent of the contracting agency's right to direct and control the contractor's work. Finally, document each of the factors used to determine the classification to prepare for a possible, eventual challenge. "On January 25, 2019, the National Labor Relations Board (“NLRB”) issued an important decision in SuperShuttle DFW, Inc. and Amalgamated Transit Union Local 1338, 367 NLRB No. 75, Case 16-RC-010963 (Jan. 25, 2019), holding 3-1 that franchisee drivers who operated shared ride vans were independent contractors, not employees, under the National Labor Relations Act (“NLRA”). "In SuperShuttle, the Board found that the franchisee drivers were required to purchase or lease a van and enter into a franchise agreement with strong indemnification provisions in favor of the operator. The drivers also had total control over their work schedules, determining how much or how little to work, and had discretion on what trips to accept. According to the Board, these factors demonstrated a significant opportunity for economic gain, as well as a significant risk of loss," according to Debra Friedman and Christopher Hennessy, attorneys at Cozen O’Connor. Disclaimer: Please note that the information provided, while authoritative, is not guaranteed for accuracy and legality. The site is read by a world-wide audience and ​employment laws and regulations vary from state to state and country to country. Please seek legal assistance, or assistance from State, Federal, or International governmental resources, to make certain your legal interpretation and decisions are correct for your location. This information is for guidance, ideas, and assistance. Want to Know More About Workers' Comp? What Is Harassment In the Workplace? For What Reasons Will an Employer Fire an Employee? What Are Paid Personal Days for Employees? What Is a Part Time Employee? What Are References and How Can You Use Them to Your Advantage? Do You Know Your HR and Management Acronyms and Abbreviations? What Hiring and Recruiting Trends Affect Employee Recruitment? What Are Payroll Taxes and Deductions? What Is a Non-Exempt Employee and How Is This Decided? What Does Managing Human Resources Mean? Want the Best Employees? Offer the Best Benefits.